Private healthcare service LycaHealth have been announced as the Official Health Partner of the 2018 Canary Wharf Classic, PSA M100 tournament and will sponsor the annual Corporate Challenge held on finals night on March 9 at London’s iconic East Wintergarden. The deal, which was brokered by Leverage Agency, will see this year’s Corporate Challenge rebranded as The LycaHealth Corporate Challenge incorporating the Squash Mile Squash Competition. The final of the LycaHealth Corporate Challenge will see Aviva Investors face either the Financial Conduct Authority (FCA) or OC&C Strategy Consultants in the final. The Square Mile Squash Competition (as it was known then) was first held in 1983, with Samuel Montagu & Co. winning the inaugural title. “The Corporate Challenge is an important part of the Canary Wharf Squash Classic and we are delighted to welcome LycaHealth on board as the Official Health Partner of the tournament,” said Tournament Director Tim Garner, of Eventis Sports Marketing. “The East Wintergarden is a unique venue in the heart of Canary Wharf and is an ideal location to host some of the city’s leading and most influential corporations. LycaHealth Chairwoman Prema Subaskaran said: “It’s wonderful to be a part of such a historic and popular competition here in Canary Wharf, where we opened our first LycaHealth centre in 2015, which has since become a leading provider of consultation and diagnostic healthcare services. The use of our centre will be open to all participants should there be any injuries, so they can be rest assured they’ll be back fighting fit in no time. 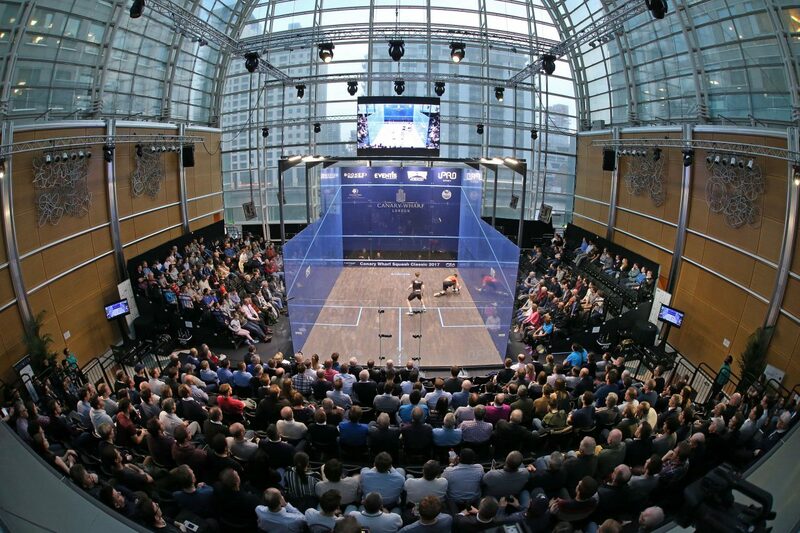 The 2018 instalment of the Canary Wharf Squash Classic will see the tournament celebrate its 15th edition and it will be staged at East Wintergarden between March 5-9. In addition to the record $100,000 prize purse on offer, this year’s Canary Wharf Squash Classic will become the first ranking PSA World Tour event to use a best-of-three games scoring format up to the semi-finals. World Champion Mohamed ElShorbagy heads the draw ahead of World No.3 Ali Farag, younger brother Marwan and four-time champion James Willstrop. Live action from the Canary Wharf Squash Classic will be broadcast live on SQUASHTV (Rest of World) and Eurosport Player (Europe only), while mainstream channels across the globe will show coverage of the semi-finals and final, including BT Sport, beIN Sports, Fox Sports Australia, Astro and more. LycaHealth’s mission is to combine their expert knowledge with technological innovation in order to deliver an exceptional and highly personal experience to all of their clients. By capitalising on their wealth of expertise and by listening carefully to their clients’ needs, they devise healthcare solutions that exceed expectations. Specialising in the provision of rapid access to diagnostic imaging, to include MRI, CT, X-Ray and Ultrasound, LycaHealth also has an on-site private GP service, Travel Clinics, and specialist consultants in clinical areas such as Orthopaedics, Gynaecology, Cardiology, Urology and Dermatology to name a few. Their goal is to extend their reach, to offer clients all around the world advanced healthcare expertise, consultation and diagnostic services within the local community, as they seek to deliver the highest levels of advanced and ethical healthcare within a 5* luxury environment.